The B400 Boom Stand delivers essential features at an economical price. 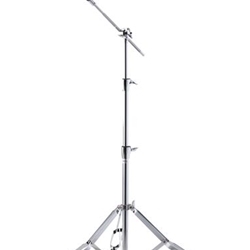 The multi angle boom arm provides compact storage and transportation while the multi-step boom, the cymbal tilters and the 3 tier height allow for convenient positioning. The smaller tube diameter makes this stand lighter to carry while the double-braced legs provide needed stability. Available in Chrome plated finish.